St Anthony is a gem and is deservedly given one star by Simon Jenkins ‘an example of early Gothic restoration by the sea’. A redundant church, it is tucked away behind Place House which stands on the site of what was once a small monastery. The approach to it is down a wonderful leafy path. The small spire on a central tower looks immediately unusual, as does the triplet of lancet windows in the east end. 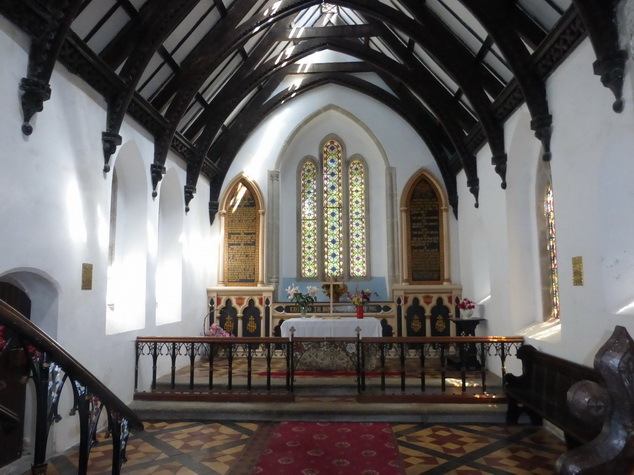 Historians argue as to whether this is a good example of how a Cornish church might well have looked or whether it is simply the result of over-restoration by an enthusiastic C19 vicar Rev C W Carlyon (his family appears to have been almost hereditary rectors hereabouts). An enthusiastic amateur, he carved many of the rather heavy bench ends himself. 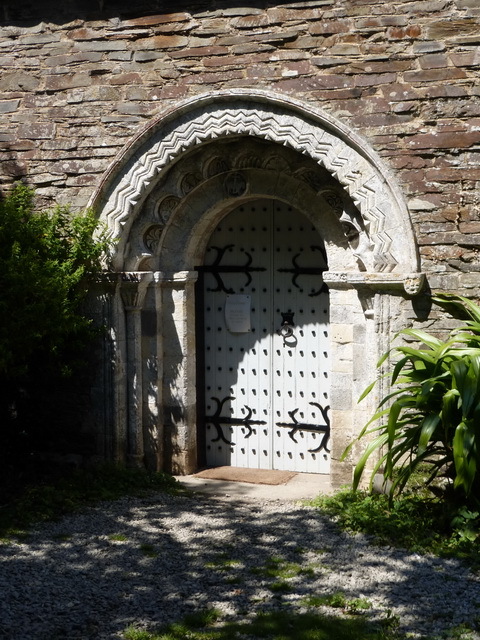 The most striking, unexpected and glorious feature is the south door which was probably moved here from Plympton abbey. Whole essays could be written about its delights and why the Agnus Dei is slightly off-centre. Inside, the church is relatively light thanks to the simple glass and various small windows in the roof, including a novel feature which is almost a micro-clerestory along the ridge line. It is a simple nave and two transepts. The central tower necessitates four large elegant supporting arches whose corbels are charmingly carved: foliage on the four nave one, heads for the four transepts. The Spry family who owned the House is ever-present. A small north door marked ‘Private’ leads into the House: no doubt this was once the night stair. The whole north transept is dedicated to the family and extravagant monuments commemorate admirals and fine upstanding gentlemen. The whole effect is one of light and although there are few medieval details left, the whole is harmonious and a joy. Outside, beside the path, is a medieval coffin which looks as though it has been reused as a cattle trough.